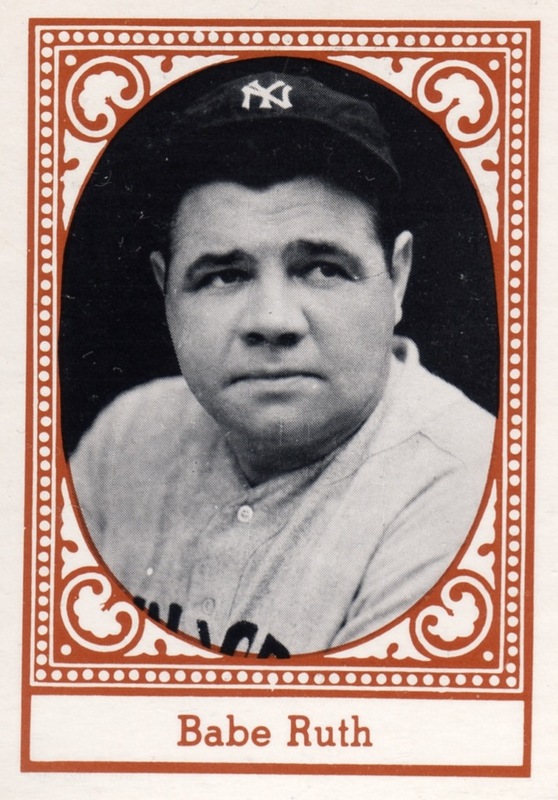 I suppose it doesn't get more All-Time Yankee than Babe Ruth. 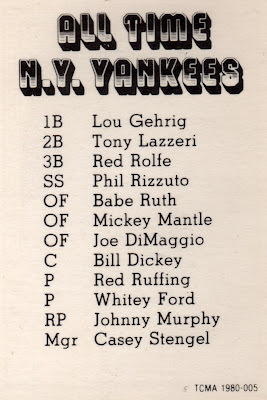 This 1980 TCMA set numbers 12 cards, one for each meaningful position on the field, with two starting pitchers (Red Ruffing, Whitey Ford), a relief pitcher (Johnny Murphy) and manager (Casey Stengel). The Bambino serves as right fielder. 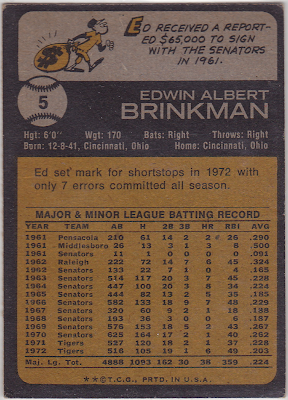 TCMA pumped out six different All-Time sets in 1980, using roughly the same format for the Cubs, White Sox, Yankees, Tigers, Giants, and Dodgers and most say "All-Time [Team Name]" on the front somewhere. 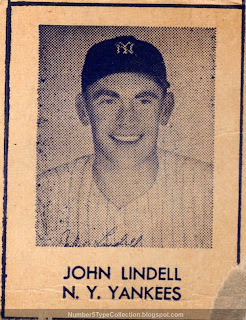 The Yankees are an exception, showing only the player name and an old-style portrait frame. It's an interesting enough set, though there's no problem finding other oddball examples for most of the players—and probably with better pictures at that. Value: I pulled this Ruth a few years back from a dealer's $3 box at the Fort Washington (aka Philly Show) card expo. 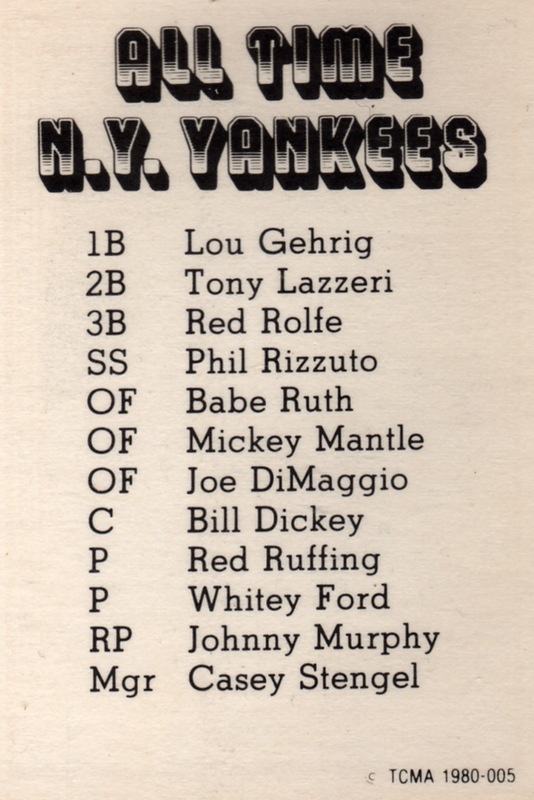 Fakes / reprints: Not even Ruth and Gehrig make this kind of set worth reprinting, so the risk is pretty low! 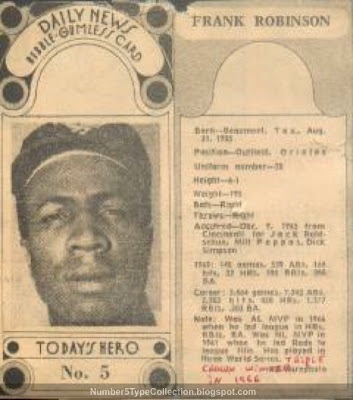 This Frank Robinson newspaper “card” comes from way back in 1970, two years before my own name appeared in the birth section. 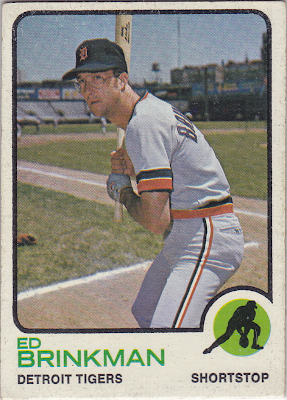 His career still in full swing, Frank both started for the 1970 AL All-Star team and won the series for the Orioles over his previous team, the Cincinnati Reds. As good as he was then, Frank's gaudy numbers from the pitching-friendly 60s could've been even bigger under the fitness and power-first regimens of today's game. 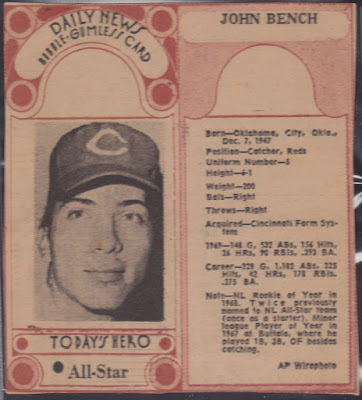 These “bubble-gumless cards” came from a Dayton newspaper, who I assume create that year's set to support Cincinnati's hosting of the 1970 All-Star Game. The paper printed a set of 160 players and covered every corner of the country, not just Orioles and Reds. 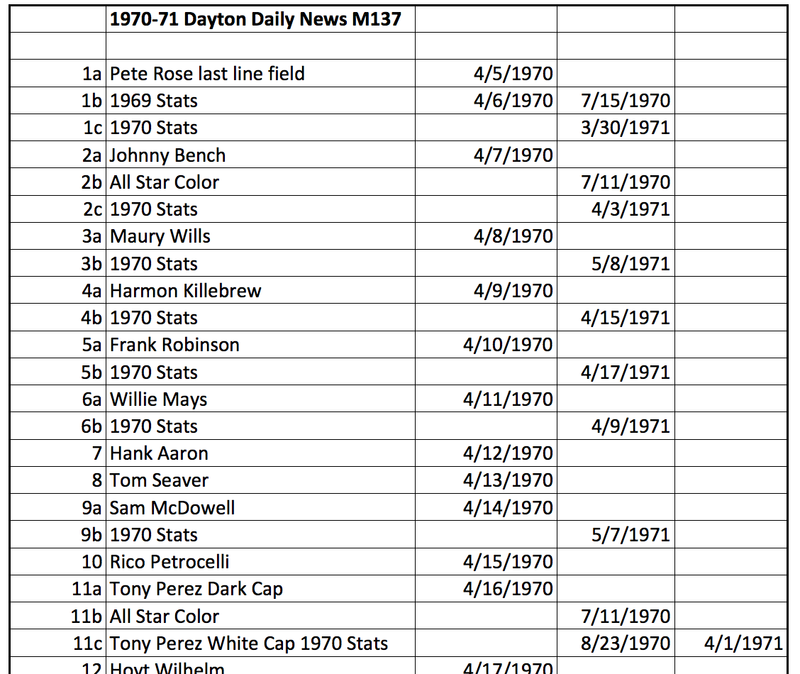 After Cincinnati won the NL pennant in 1970, Dayton reran a similar (but not identical) checklist for 1971, adding 1970 season stats, using alternate photos, and swapping some players who changed teams or retired. This created a maddening number of variations for collectors who like to work on such challenges. Good thing I'm happy with just a type card! 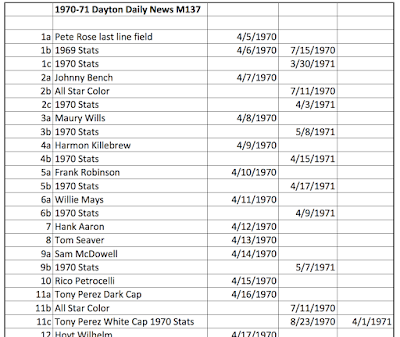 The (currently inactive) blog Uncatalogued Baseball Cards checklisted both years of "cards" in their entry for Dayton Daily News. See that link for a downloadable PDF of the full checklist. 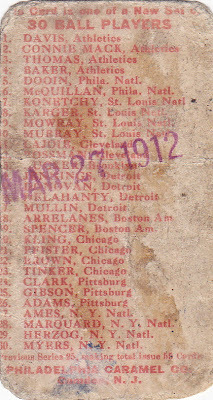 Note that checklist says #196 is "unknown," but it's since been ID'd as Bob Matheson in a Dayton set variations thread from Net54. 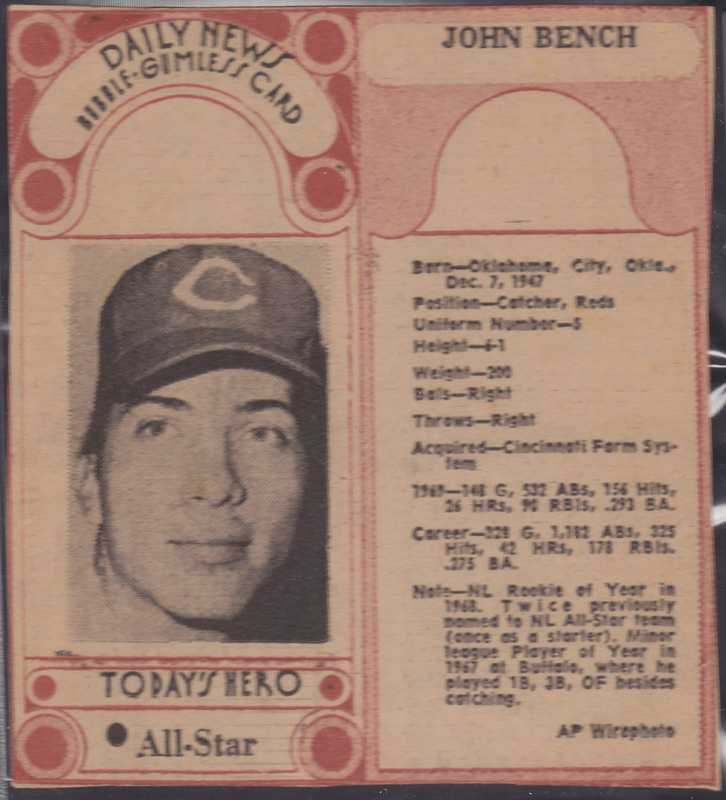 Johnny Bench is one of a handful with three variations: his "2b" version adds "All-Star" and red tinting to recognize his hometown appearance in the 1970 All-Star game at Cincinnati's Riverfront Park. While this set's technically "catalogued" in the SCD annual vintage guide, no less than erstwhile SCD editor Bob Lemke agreed these bits of newspaper could be dropped in future editions, if space in the annual guide became a premium. This forum thread on Net54 debated if newspaper cutouts meet a minimum bar for "cards" and could thus be excluded. Decades later, the vintage side of cards is still alive! 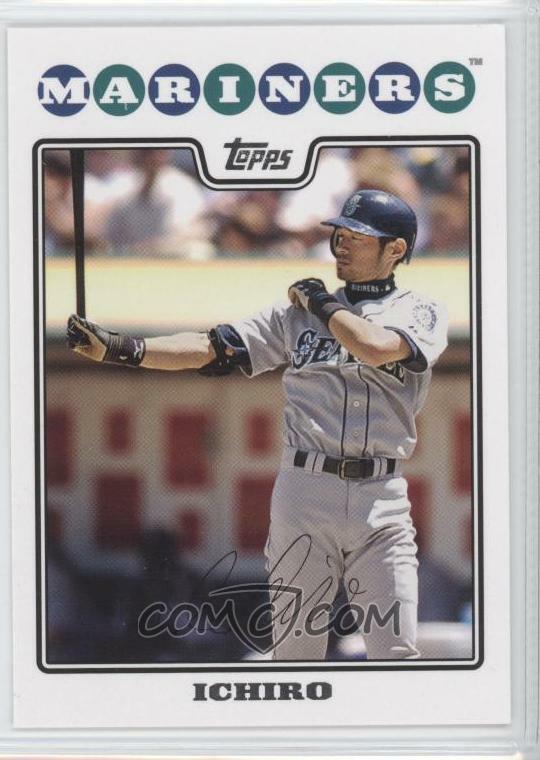 Value: An oddball dealer at the National Sports Card Collectors Show of 2007 sold me this #5 for $10. The red ink pen (somewhat visible at the lower right) notes Frank was “Triple Crown Winner in 1966," which no doubt knocked a little off the final price. Early Philadelphia catcher Red Dooin couldn't hit much, but understood pitchers well enough to parlay limited physical talents into a 15-year career, 5 of them as player-manager for the Phillies. He debuted on the dugout steps in 1910, the same year this caramel set hit candy stores. Many credit Red with the emergence of HOFer Grover Cleveland Alexander, a diamond discovery for any scout or coach. I credit Philadelphia Caramel with hand-tinting Red's hair for their set. Tobacco companies collectively exited the baseball card market in the early 20th century, just as commercial candy production became viable. 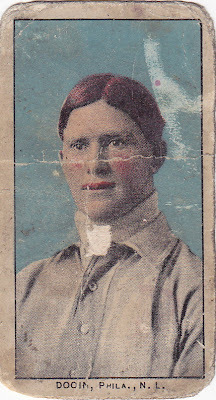 These Philadelphia Caramels, also known by their E96 American Card Catalog number, feature a tinted portrait on the front and 30-player checklist on the back. Although there's no prominent "number 5," the card itself catalogs Red that way. 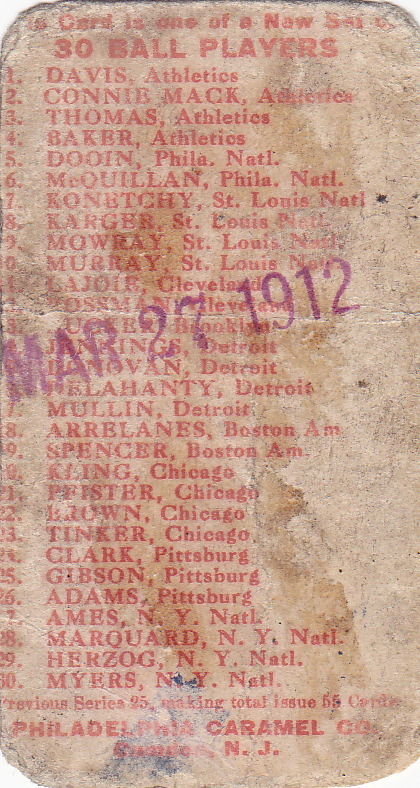 I'm not sure where the March 27, 1912 stamp came from, but one possibility is a stock marking. Stores often marked merchandise upon arrival, and earlier issues sometimes show a date in pencil. However, most E96 cards came in candy packages, so it's more likely someone wanted to stamp things and tested the ink on some nearby paper--their card of Mr. Dooin. Facts of great importance: The 1915 pennant-winning squad featured a rookie named Bud Weiser. My #5 card back features the "mirror" John see below. It's likely a printing accident, where someone placed one card sheet directly onto another, still wet from the press. Surprisingly, several players from the set's short checklist still resonate with today's collectors. Lou Gehrig makes an unexpected posthumous appearance amid active luminaries like DiMaggio, Williams, Jackie Robinson, and Spahn. Despite the low-quality printing, some vendors charge a pretty penny for the big names. If you really want a Ted Williams card from his playin' days, stick with the normal (and beautiful) 1950s Topps cards and leave R348s to the rarity-obsessed. Coincidental with the year of issue, the set numbers 48 cards, but includes a number of variations for picky collectors. Some show different teams, a few come in black-and-white instead of blue, and others lack a number on the front. Master set builders--and you know who you are--probably find the set tough going because few circulated in the first place, let alone any subgroups. UPDATE: Johnny Mize's card features an odd STL logo I've never seen on another card. 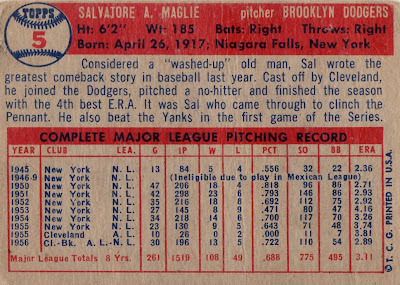 To double up the mystery, he last played for the Cardinals in 1941, several years before this set came out. Anyone have an idea where or when this picture came from? Value: This #5 cost $6 on eBay, typical for low-grade cards. Superstars like Williams and DiMaggio run $40 or more in low-grade. Fakes / reprints: Haven't seen any, but they probably exist for the big names. Go for the lesser-known players if you want a type card to avoid that risk. 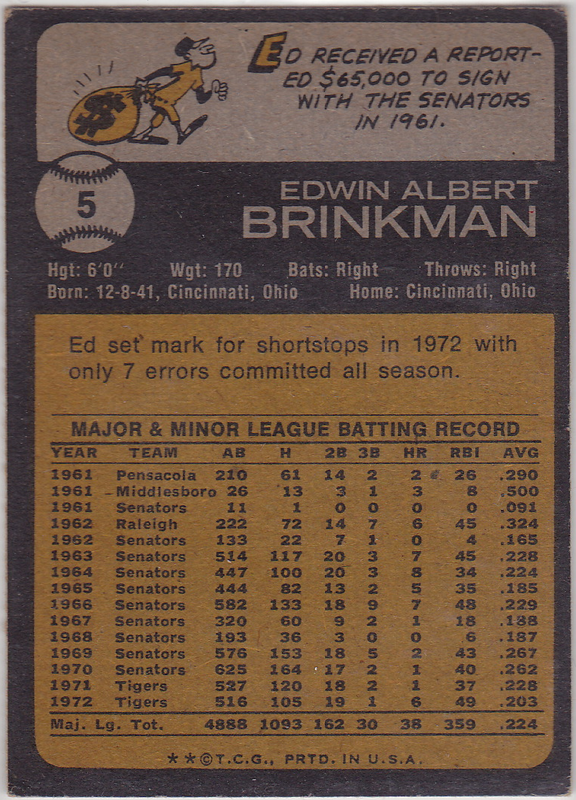 In the age of excellent card photography, this big glasses, helmet-less, hunchback composition of Mr. Brinkman looks like a red-headed stepcard. The cameraman probably caught Ed awaiting batting practice and surprised him with a head-high paparazzi fastball. My short play Waiting for Brinkman captures the moment. This might be Ed's lamest card. 1964's "Ennui" Brinkman comes close, but at least we know what he actually looks like. 1973's version looks like generic 70s Detroit Tiger. As an everyday player and fan favorite for the 1960s Senators, Ed set many franchise records with the glove and even placed highly with the stick due to longevity. Fielding prowess led to some MVP votes in 1973 despite a .205 (!) batting average. His last hurrah came in 153 games with the 1974 Tigers, where he produced a career-high 14 homers and 54 RBIs. Unfortunately, Mr. Brinkman passed away on Sept 30th at age 66. RIP, Steady Eddie! 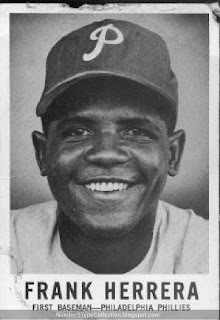 Mr. Herrera looks pleased as rum punch to take the field for the Phillies, despite 1960's last place finish and 59-95 record. The Leaf set's high-contrast black-and-white compliments his Cuban skin and the backlight halo makes him positively beatific. You need this kind of attitude on last place teams, given how quickly the losing can grind players down. Pancho played almost every game at first base in 1960 and hit productively enough to finish runner-up in the ROY voting. He also posted 17 appearances at second base, something rare by today's standards. An overall fielding percentage of .988 reveals real limitations with the glove, but his stick led the team's regulars in 2B, 3B, HRs, RBIs and only Tony Gonzalez slugged better as a regular player (but with half the ABs). It's evident Herrera hit like a classic first-baseman. Perhaps unfortunately for his career, he struck out like the modern version. Many now think that 136 Ks don't matter much when you excel at hitting for power and are otherwise productive. Someone who did so in previous generations, unfortunately, needed to be a star to escape the "swing at anything" stigma. Setting the major league record for Ks (as he did) in your rookie season makes for a challenging first impression. Considering his two years of above-average production, it intrigues me that Pancho never appeared in a game after 1961. 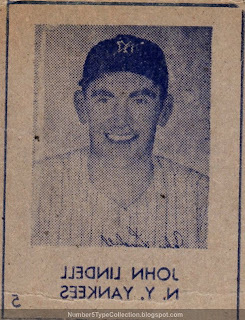 Herrera spent 1962 at Triple-A Buffalo and the Phillies eventually traded him to Pittsburgh as part of a deal for a fading Don Hoak. Although only 29 in 1963, the Pirates apparently couldn't find a position for him and that was, as they say, "it." Occasional appearances at Philly old-timer games tell the remainder of his story in uniform. One could argue there's not much to say about this shiny (but otherwise unremarkable) Topps insert set from the mid-1960s. Another card blog I know, Things Done to Cards, recently profiled the important elements. Smaller size than typical, 72-member checklist, usually seen in gold foil but sometimes in silver, etcetera. As coins circulate, they wear much like Mr. Skowron's profile shows here. Raised features smooth out slightly, details fade into the background, and flat elements abrade or scratch. Surface wear kills the value for most cards, since image is everything. Coins better withstand life's vicissitudes, made as they are for handling and exchange. It's interesting our hobby escalates a paper image over metal coins, which usually turn up only as oddball issues. Aluminum, nickel, and steel all hold higher innate values, but something the size of a quarter doesn't capture baseball's dynamic nature. The ball can move hundreds of feet in just a few seconds, whip around the base paths, or become a treasured souvenir. Something about a photo card captures that possibility and I feel that's the failing here. 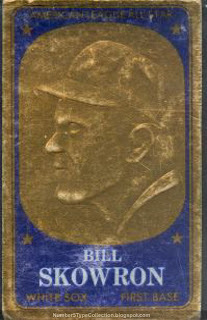 This embossed set stultifies the players into busts appropriate for a museum. They go stiff and dumb when we expect and anticipate action. Great sets turn on creative design that opens up the holder's mind or captures a kinetic moment. Ungreat sets pin things to a single outcome or point of view. I'd rather have the potential. 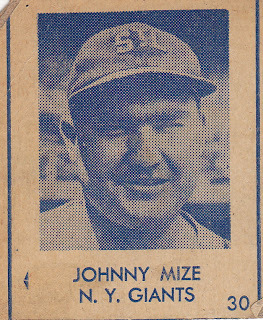 Bazooka cards often end up in low-grade collections like mine because of the hazardous fallout of a baseball-loving kid who may or may be handy with scissors. Fortunately, whoever liked this Dean Chance card thought enough of him to separate it carefully and with a steady hand. The photo composition does a good job with very little space and even avoids the deadly lighting from above. Props to the camera guy! I met Dean at the National Card Show a few years ago through a friend of mine who's a big Chance fan. 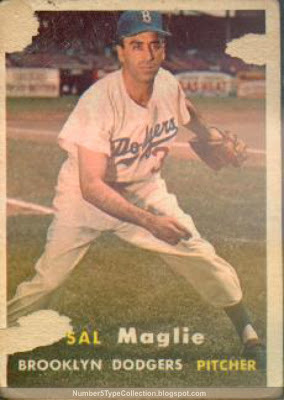 Not many pitchers, even those from the pitching-friendly 60s, finished their career under 3.00 ERA. (He ended up at 2.92 with a .527 winning percentage.) A decade or so ago, he founded the International Boxing Association, so it's good to know he didn't rest on any laurels. Based on my brief encounter, he seemed an outgoing guy and ready to talk basketball, boxing, or the news of the day. 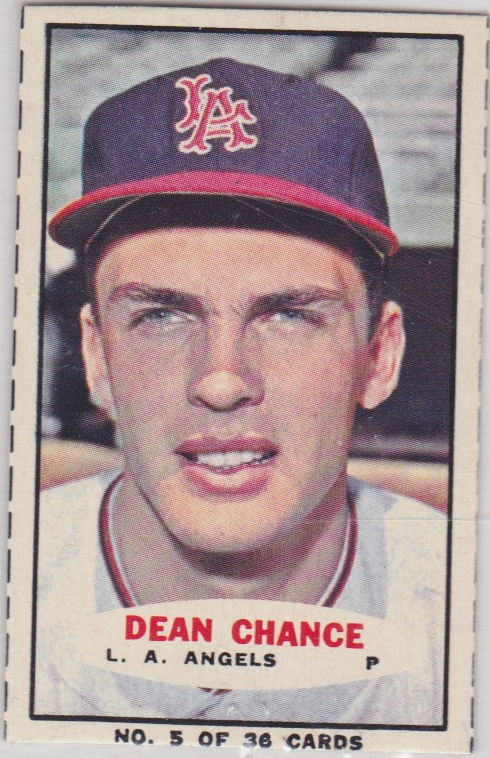 Most years, Dean pitched over 250 innings, which makes the performance even more impressive, but likely shortened his career. 2007's Josh Beckett, as a modern comparison, won the same 20 games as Dean's 1964 Cy Young season in 75 less innings. Josh pitched 1 complete game, 14 less than Chance. "Save the pitcher's arm" is an easy drum to beat, but there's another component beyond simple wear-and-tear. Fewer pitches thrown means less data for an opponent to analyze in search of pattern and weakness. In a similar vein, FootballOutsiders.com argues that quarterbacks do better than expected in their first few games because opposing defenses don't have game film to plan against. Recall how a pitcher's task becomes more difficult each time through the opposing lineup. Baseball's depth of statistical analysis means they need more than one or two good pitches to lean on. To my eye, throwing fewer innings meets both the long-term need (save the arm) and the short-term goal (save the game).